When it comes to cooking meals in the fall time, I often time fall back on roasting, just about everything. From slow roasting meats, to root vegetables and squashes, and stone fruits, apples and pears for dessert. The key is to mix it up, by trying new rubs, spices, and sauces to use when roasting. Over the summer I was sent a small container of harissa paste, and quickly turned that into a harissa-cumin-maple syrup type of a sauce for carrots, cauliflower and brussels sprouts. Now that we are in fall and squashes are bursting at the markets, I made the same sauce, tossed it with delicate squash wedges and roasted until caramelized. Serve this over a bed of lentils, dollop of yogurt and a good sprinkle of mint. Wash the dried lentils and drain. Place the rinsed lentils in a medium saucepan and add 2 cups of water. Heat the water over medium-high heat bringing to a rapid simmer. Reduce the heat to a low simmer and cook for 20 minutes until tender. Remove the lentils from the heat, add olive oil and a pinch of salt, toss and set aside. Preheat oven to 450 degrees. In a small jar whisk together the harissa paste, garlic, olive oil, cumin, maple syrup. Whisk, taste, and add salt and pepper. Place delicate squash onto a large baking sheet. Pour 3/4 of the harissa-cumin sauce over the squash, reserving the remaining sauce aside, and toss together coating all sides of the squash. Season with salt and pepper and roast for 35 minutes, turning occasionally. 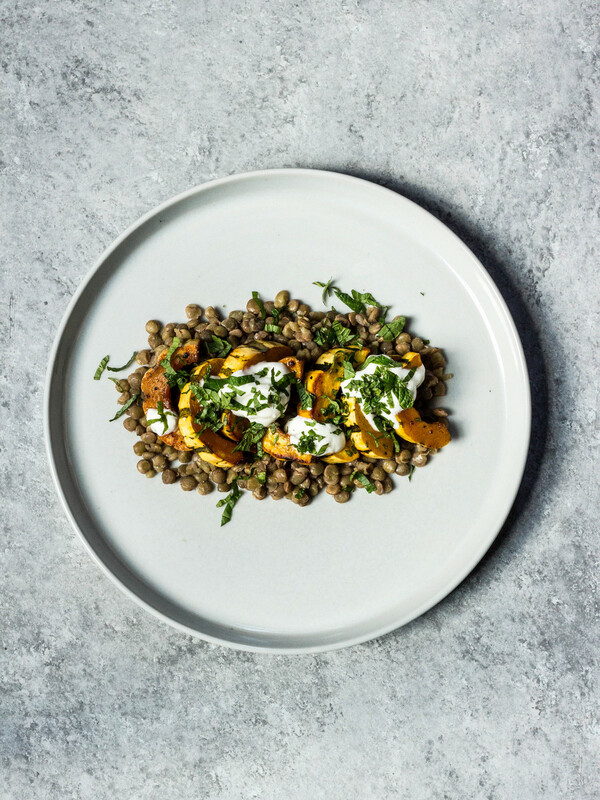 Place lentils on serving plates, top with roasted delicate squash, a dollop of yogurt and shredded mint. Use the leftover harissa-cumin sauce to add on top, or mix into lentils.